This engine simulator is used extensively during on station training, it gives the crew and officers a very good idea of the intensity of an engine fire. Gas is pumped out at high pressure to give maximium effect and realism in the trainging yard. 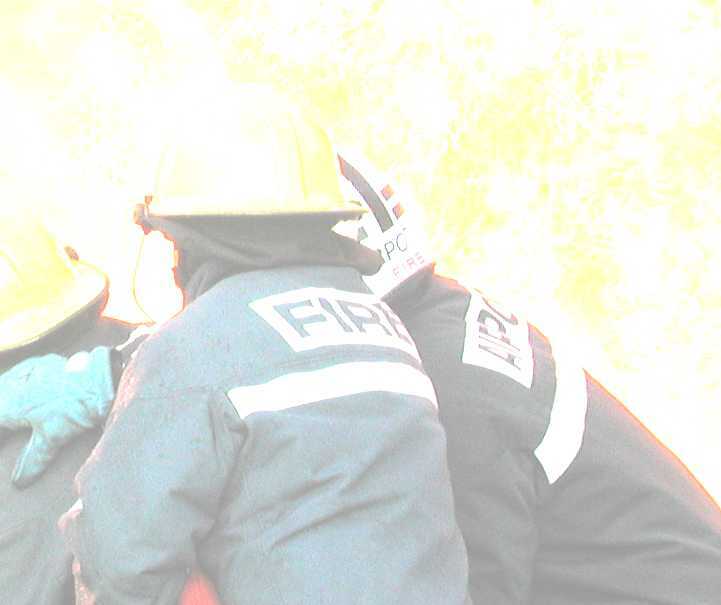 The fire screen is an invaluable tool for fire ground training particularily to mimic the effect of a massive fireball, technique and good teamwork is the secret to tackling this fire and it helps to encourage good communication skills between the firefighter under pressure. The idea of this exercise is to give the crew an insight into the types of difficulties experienced with fuel and how to deal with a running fuel fire and fuel fires under pressure. A gate valve is set alight and the crew have to contain the fire and subsequently extinguise the blaze. The nearest thing that can be said to mimic a catastrophic full aircraft incident. This rig is designed to represent the fusilage of a 737 or equivelent aircraft. Fuel under pressure is pumped out all around the two rigs and the underneath is also set on fire thanks to the availability of wells into which aviation fuel is poured and set on fire. Monitor training with foam is practiced on this rig and BA teams enter the smouldering hulk while still at very high tempetures, beside the rig is another rig which is often packed with casualties which have to be rescued in the event of an exercise. All in all this is reality training at its best.